I got this polish in a random MakeupAlley swap. It was a Beauty Brands (I am not personally familiar with the store) exclusive for holiday 2010. 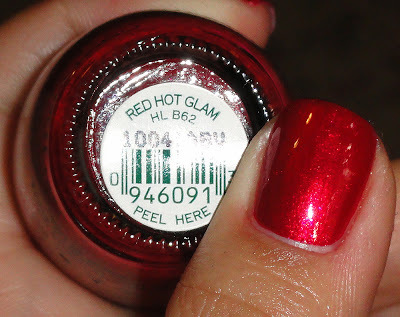 Red Hot Glam is a blue based red, kind of around the same hue as I'm Not Really a Waitress, with microshimmer in red and blue. Very flashy and very holiday appropriate. This is three coats.